I checked the iPhone weather app before packing but what does 64 degrees really feel like (and we all know you can't trust the iPhone weather app)? Since I didn't bring a suitcase and I wasn't only traveling for a week before returning home I needed to pack layers that could work for multiple occasions and climates. AND it all had to fit into my backpack that had actual important things in it like medicine to keep me alive if I were to get sick. You know that sort of important stuff. When I backpack I wear the same thing over and over again. This was going to be no different in Scotland even though it is a first world country with a lot of people who have the chance to do laundry. No worries, I have been wearing the same sweatshirt for five days now. Ain't no thang. 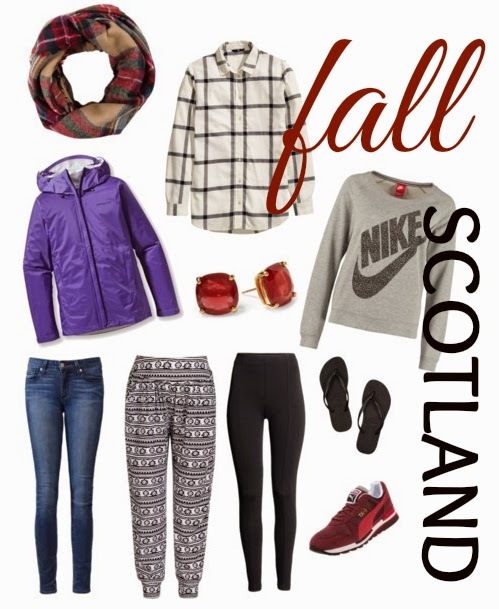 Above is a visual list of what I wore during my week visiting Glasgow and Edinburgh. P.S. I also think three pairs of pants is excessive but the jeans will be flying home with my mom after Tanzania and probably the tartan scarf I picked up in Scotland too. Who needs wool on the beaches of Zanzibar.